The regional National Weather Service has moved its operations from Taunton, Massachusetts, to nearby Norton. The regional National Weather Service continues to settle into its new home in Norton, Massachusetts. Until just last month, it had most recently been located in Taunton. 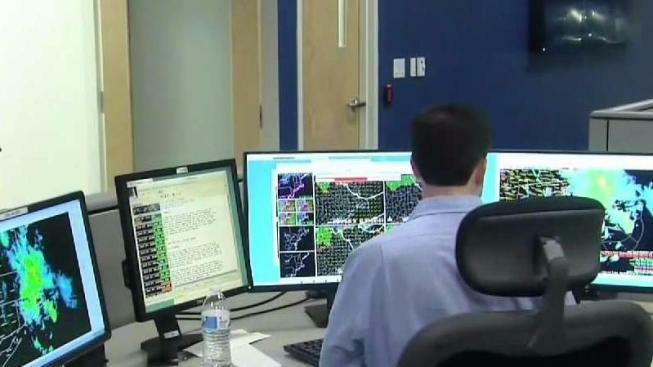 It is responsible for monitoring the weather in much of Massachusetts, Connecticut and Rhode Island. The new building provides not just a new, updated physical space, but also new tools to better convey the impacts of weather to those living in Southern New England. Two large television displays will eventually show forecasters live cameras, river gauges and meteorological charts. That's in addition to numerous work stations around the operations floor. Forecasters say this will better allow staff to figure out what's happening now, and how it is actually impacting people. For example, showing if snow is falling and sticking to roads or power lines, or if it's melting on contact. The National Weather Service in Norton, one of more than a hundred such offices around the country, is also beefing up its 'Decision Support' services. That program offers emergency managers and planners with specific forecasts for major outdoor events. The meteorologist-in-charge of the Norton office, Bob Thompson, is especially excited to see the new building come to light. It caps off a long career with the National Weather Service, spanning 45 years. Much of that time was spent in New England. Thompson retires on Monday.